Delivering ±0.1°C accuracy across a wide range, with zero calibration during manufacturing, the new sensor family saves designers time and reduces production costs for systems requiring high accuracy. Supports clinical temperature requirements: For medical applications, the TMP117M provides ±1°C accuracy from 30°C to 45°C and supports American Society for Testing and Materials (ASTM) E1112 and International Organization for Standardization (ISO) 80601 requirements for patient thermometers. ±0.1°C from -20°C to +50°C. ±0.15°C from -40°C to +50°C. ±0.2°C from -40°C to +100°C. ±0.25°C from -55°C to +125°C. ±0.3°C from -55°C to +150°C. Reduce system complexity: With the TMP117, engineers gain the accuracy required for their application without the design and manufacturing complexity of typical solutions. Comparatively, to achieve a similar level of accuracy with a platinum RTD, engineers must select a multitude of precision components, simulate and fine-tune the circuit, carefully lay out the PCB to avoid impedance mismatches, develop software to linearize the output and calibrate each system. Accelerate design time: The TMP117 and TMP117M are I2C- and SMBus™-interface compatible and provide a direct digital readout of the temperature, which significantly reduces design, layout and simulation time, and speeds time to market. Using only 6.3 µW, the TMP117 and TMP117M enable engineers to achieve longer battery life and more accurate temperature measurement in their designs. Use significantly less power: The TMP117 consumes up to 95 percent less power than a typical RTD measurement system, enabling designers to meet tight power budgets in field transmitters or battery-powered applications. Minimize the impact of self-heating: The low-power consumption of the TMP117 and TMP117M minimizes the impact of self-heating, enabling more accurate temperature measurement. The TMP117 and TMP117M join TI’s portfolio of digital temperature sensors that enable engineers to integrate smart thermal monitoring into their designs, choosing from high-accuracy, low-power and small-package options. Engineers can jump-start the design of their high-accuracy applications with the TMP117EVM Evaluation Board. 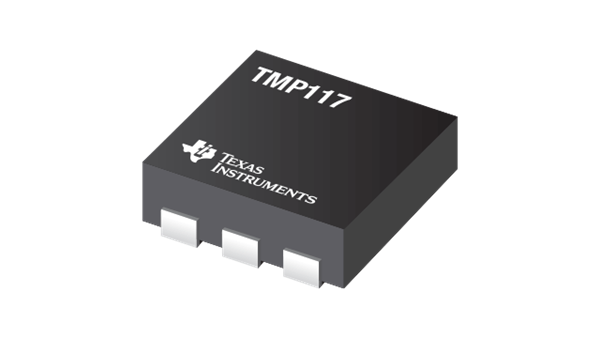 TMP117M digital temperature sensor for medical applications is available now in volume quantities and preproduction samples of the TMP117 digital temperature sensor are now available through the TI store. Both devices will be available in 6-pin WSON no-lead packaging. The TMP117 digital temperature sensor and TMP117M digital temperature sensor for medical applications are priced at US$1.60 and US$2.44 respectively, in 1,000-unit quantities. Download the TMP117 digital temperature sensor data sheet. Check out all of TI’s temperature sensor integrated circuits (ICs). Search for solutions and engage with fellow engineers and TI experts in the TI E2E™ Community Sensors forum. TI E2E is a trademark of Texas Instruments. All other trademarks belong to their respective owners.